The low fat diet does not prevent arterial disease – it causes it. Finally 2 years after my now notorious 7-word Tweet hit the Tweetosphere, I had my day in court. In fact 5 and a half days in which I presented more than 30 hours of testimony with some 900 slides. It was certainly the most complete single presentation on the high fat low carbohydrate (LCHF – Banting) diet yet heard in South Africa and perhaps in the world. 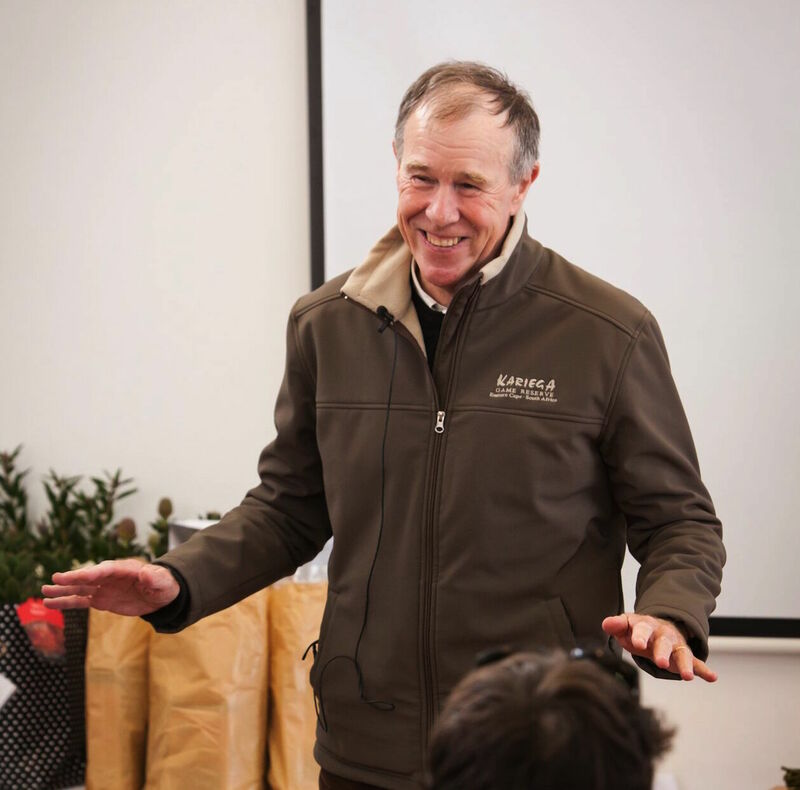 In time we will post all this information on The Noakes Foundation website including PDF copies of all the important scientific studies that I cited. But in the interim I consider it appropriate to describe what I think are the two most important ideas that have crystallized in my mind as a result of the “trial”. They help explain why I think as I do and why, in my opinion, this debate holds a key to the future of medicine, not just in South Africa but globally. I argue that the future of both medicine and of global health requires that we finally acknowledge the importance of some core issues. Our current low fat dietary advice does not prevent arterial disease (for example of the heart). Instead it is the direct cause of an epidemic of arterial disease that will consume most of our medical resources within the next 10-20 years. Shortly before the “trial” reconvened in February this year, my legal team was informed that the complainant, Ms Jusling-Strydom, had decided to call another expert witness, Professor Jacques Rossouw, an ex-patriat South African now resident in Washington DC. Professor Rossouw is well-known to me. In the early 1980s I was a (peripheral) member of his research team that undertook a population intervention trial in 3 towns in the Western Cape, the so-called CORIS study. The goal was to determine whether an intensive hands-on “heart-healthy” intervention program in one town would produce better long-term health outcomes than a less intensive intervention in a second town in which the sole source of “heart healthy” information was that sent through the mail by the study organizers. Four years later the researchers returned to the towns to measure the effects of the intervention. Surprisingly they found that the outcomes were essentially the same in the two intervention towns – in other words the more intensive program targeting high-risk individuals had not produced any additional benefits. Eight years later a second follow-up found that although the risk factor profiles had continued to improve in all 3 towns, improvements in the low intervention and control towns were far greater than in the town exposed to the most intensive intervention. The final conclusion was that the low intensive intervention was the most successful. So according to the scientifically-revered null hypothesis, the study proved that a “heart-healthy” hands-on intervention is no better than just giving general health advice through the mail. But how can that be if the high intensity intervention is based on the “best” medical evidence? One conclusion might be that that “best” medical evidence might not actually be the best and could even be doing some harm. But this is not how the study outcomes were presented. Instead the conclusion was spun that such intervention trials can no longer measure the “truth”. For, according to the authors’ supposition, already in the 1980s all the dietary and other information necessary to improve a community’s health was freely available in the popular media. So, according to that post-hoc logic, providing more information even with an intensive “hands-on” approach could not be expected to produce a better outcome. But science does not allow such “post-hoc” interpretations since that possibility was not considered as part of the original hypothesis. The original hypothesis being tested was whether or not the intensive intervention would improve health outcomes more than doing little or nothing. It did not. So according to the null hypothesis, the conclusion should have been that the intensive intervention – including the promotion of the “heart healthy” low fat diet – failed to make any real difference. In retrospect it is interesting that a key focus of the intervention was the promotion of a low fat “heart healthy” diet to lower blood cholesterol concentrations. In these Western Cape farming communities that, at least in the past, would have eaten a higher fat diet (although not necessarily a low carbohydrate diet), this might have meant a quite large change from the more traditional diet. What if the “heart healthy” diet was adopted to a greater extent in the intensive intervention town than in the others? And what it this diet produced an adverse outcome that outweighed other health benefits produced by other interventions? Interestingly the diet had little effect on weight in any of the towns as weight increased over the 12 years in men but fell marginally in women. Without a change in body mass towards more healthy values, it would be unlikely that long-term health would change significantly. Shortly after completing the study Professor Rossouw emigrated to the USA and in time became a US citizenship. There he became best known for his work on the Women’s Health Initiative (WHI), a $700 million study that included elements of the CORIS study writ very, very large. His participation in the trial saw him named as one of Time magazine’s 100 most important persons in the early 2000s. In part this was probably in anticipation that the WHI would finally prove that a low fat “heart healthy” diet is the perfect eating plan for human health – a finding of such major political importance (particularly to US scientific prestige) that, if confirmed, it would likely have led to the award of the Nobel Prize in Medicine to the WHI investigators. During this period, I lost touch with Professor Rossouw for more than 30 years until December 2014 when the Medical Faculty at the University of Cape Town invited me to debate Professor Rossouw in their hubristically-named “Centenary Debate”. The evening turned out to be less a debate and more a kangaroo court, at least in my opinion; the UCT Faculty’s agenda was clearly not to advance knowledge. Rather it was the start of a national program scripted to embarrass me in public. In front of a clearly hostile audience, I made 2 key points that have, and continue to be, conveniently ignored. The first was that the WHI of which Professor Rossouw was an important participant, proved that the “heart-healthy” low fat diet did not improve health outcomes in an 8-year randomized controlled trial (RCT) involving more than 48 000 post-menopausal women. The study is now one of 3 similar studies (costing US taxpayers $billions) that have conclusively proven (according to the null hypothesis) that the low fat diet does not provide meaningful health advantages or extend life. Yet despite this definitive evidence produced under his own watch from the most expensive RCT ever undertaken, Professor Rossouw continues to state (as he did in the Centenary Debate and at subsequent trips to South Africa to speak to dietitians on behalf of ADSA) that all the evidence favours the prescription of low fat diets for improved health. (And conversely that the high fat Banting diet is dangerous so that doctors and dietitians who promote it act in conflict with the Hippocratic Oath). Second I was the first to report in a scientific publication that the only significant finding in the WHI study seems to have been “lost”. That finding was that post-menopausal women who had heart disease at the start of the trial did worse if they adopted the low fat “heart-healthy diet”. Indeed as I stressed in the debate, the Table showing this effect in the original WHI publication was erroneous so that the only significant finding of the study was very difficult to detect. A decade after its publication, that error has yet to be corrected. But there was another surprise in the findings. Thus, those with type 2 diabetes (T2DM) at the start of the trial also did worse if they adopted the “heart-healthy” low fat diet. This detrimental effect was already detectable within the first 12 months of the trial. To my knowledge, the 8-year data (when the true extent of this effect in T2DM would become fully exposed) may not yet have been published. Why not? Thus the paradox in this debate: The very scientist who had participated in two studies costing billions of rands and which have both proven that the low fat diet is without long term health benefit and could in fact be harmful, was the one chosen by the UCT Medical Faculty to present the opposite argument. How was this allowed to happen in an institution committed, at least publicly, to academic excellence and the search for truth? And then in the final irony, Professor Jimmy Volmink, Dean of Health Sciences at the University of Stellenbosch and long-term friend of Professor Rossouw, declared in his summary at the conclusion of the Centenary Debate that by advocating a diet that was unproven and might do harm, I was acting in conflict with the Hippocratic Oath. This despite the fact that in the Centenary Debate I had clearly shown that if any diet is doing harm, it is the low fat “heart healthy” diet. So who truly is acting in conflict with the Hippocratic Oath? The fact that Professor Rossouw’s research has provided the definitive evidence that a low fat diet is without benefit and may even be harmful continues to escape the attention of the Dean of Health Sciences at the University of Stellenbosch. So with the renewed prospect that Professor Rossouw would be coming to South Africa to act as an expert witness at my “trial”, I again carefully reviewed the information he had presented at the Centenary Debate as well as his submission as a potential expert witness in the “trial”. (In the end and at the last moment, Professor Rossouw chose not to make himself available for the “trial”). In a study quoted by Professor Rossouw and which showed falling heart attack rates in England and Wales, the authors estimated that about 50% of this reduction was due to smoking avoidance and 40% to improved medical care. So, at best, only a maximum of 10% could be explained by dietary change; not the 100% implied by Professor Rossouw in his writings and lectures. Nor does Professor Rossouw ever touch on the concern noted by most of the authors of these studies – that although heart attack rates may be falling, obesity rates are rising in these countries. But the answer which may be relatively simple, provides the crucial missing evidence which finally proves just how damaging is the low fat “heart healthy” diet advocated by Professor Rossouw, Dr Dean Ornish and Dr David Katz amongst many others. The key insight comes from understanding how cigarette smoking causes heart attack. [Interestingly the extent of any particular arterial plaque does not determine whether or not it will rupture. Small or large arterial plaques seem to have pretty much the same propensity to rupture. This is why coronary bypass grafting or the placement of a stent in a narrowed coronary artery does not guarantee immunity from future heart attacks. This is because a small plaque in a partially obstructed (but un-stented or not by-passed) blood vessel is also liable to rupture, causing heart attack or sudden death]. The low fat diet exponents like Rossouw, Ornish and Katz amongst others, would like us to believe that if heart attack rates have fallen subsequent to the introduction of the low fat “heart healthy” diet in 1977, then obviously the low fat diet is working to prevent all arterial disease. But to reach this conclusion they have to insure, like magicians, that neither doctors nor dietitians nor the general public notice the massive elephant in the room – the exponential increase in the incidence of occlusive arterial disease in those with diabetes – the pathology that will ultimately bankrupt all medical services globally. So this deception successfully hides the fact that diabetes is by far the worst form of arterial disease that we know. And no one asks: If the low fat diet prevents arterial disease in the heart vessels, then why does it not prevent the form of occlusive arterial disease present in diabetes? Surely if rates of diabetic arterial disease have increased exponentially since the 1977 “heart healthy” low fat dietary guidelines were introduced, then those guidelines cannot be preventing the most important form of arterial disease. The much more likely conclusion is that the 1977 dietary guidelines are the direct cause of the most prevalent form of arterial disease – that present in those with insulin resistance (see next column) and diabetes. The myth that the low fat “heart healthy” diet will prevent all forms of severe arterial disease is based on four popular deceptions. The first is that the secular trend in (falling) heart attack rates in many countries is due solely to the 1977 dietary change that promoted a reduction in saturated fat intake in those countries. But the scientists who actually performed those studies and who have no personal stake in the findings, come to quite different conclusions. Namely that many factors explain this trend and that of these factors, smoking is the most, and diet, probably the least important. These authors also note that the incidence of obesity is rising at the same time that the rate of heart attack is falling. The same applies to diabetes. So they must at least consider that the change to a low fat “heart healthy” diet is driving the obesity/diabetes epidemic. The second deception is that heart attack is a marker of all atherosclerotic arterial diseases so that if heart attack rates are falling, then so must be the rates of all arterial diseases including those caused by diabetes. But this is clearly false since the rate of occlusive atherosclerotic arterial disease in diabetes is increasing exponentially as shown by increasing rates of blindness, renal failure and limb amputations in diabetic patients. But our professional obsession with heart attacks, so skilfully manipulated by the pharmaceutical industry’s greedy interest in selling cholesterol-lowering drugs, obscures this reality. 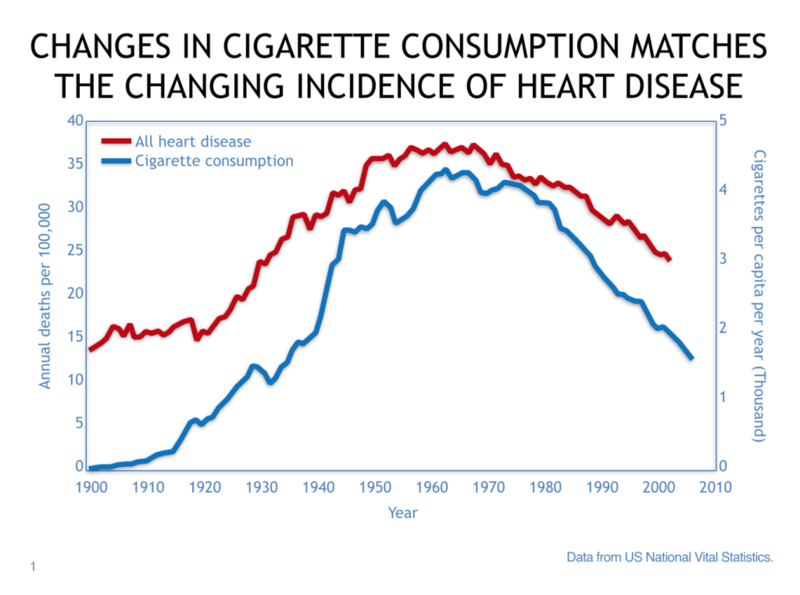 The reduction in smoking rates that began in the US some time before the release of the 1977 dietary guidelines immediately and dramatically reduced rates of acute heart attacks because smoking reduction reduced the incidence of acute plaque rupture – the immediate pathological process that causes sudden heart attacks. Because of the close temporal relationship, the promoters of the low fat “heart healthy” diet jumped on this as definitive proof that their diet is obviously preventing all forms of arterial disease. Instead what these dietary guidelines actually did was to create a global epidemic in obesity and diabetes and, as a result, in occlusive diabetic arterial disease. By describing diabetes as a metabolic disorder of glucose metabolism rather than a deadly arterial disease, this truth was conveniently hidden. The third deception is that there is absolute scientific evidence that the low fat diet prevents heart attacks and insures our long-term health. But the evidence from the 3 multi-billion dollar studies using the most sophisticated experimental methodology – the randomized controlled trial (RCT) (see next column) and which includes the WHI study to which Professor Rossouw contributed – have not shown any benefits for this diet. Instead they have identified potential for harm. The fourth deception is the unproven teaching that dietary fat causes blood cholesterol concentrations to rise and that these high levels are then the direct cause of arterial disease. I address this in the next column by showing that arterial disease is initiated by metabolic changes in the liver produced by high carbohydrate/fructose/sugar diets that cause continuously elevated blood glucose and insulin concentrations, and non-alcoholic liver disease (NAFLD) in those with insulin resistance. These changes then produce the abnormal blood fat and glucose changes – the atherogenic dyslipidaemia – that leads directly to the development of arterial plaque, at the same time promoting acute plaque rupture. In the next column I also explain why all these outcomes were entirely predictable when we encouraged persons with insulin resistance – the most prevalent medical condition across the globe – to eat highly addictive, carbohydrate-based, sugar-enriched processed foods. I will also address what all this means for the future of the medical profession if it truly wishes to prevent the 5 chronic diseases that are now killing us in increasing numbers and at progressively younger ages. We have all the evidence. What we lack is the leadership to act. Why can’t South African scientists and politicians lead the way out of this sad impasse? And so save the health of our nation? Visit www.foodmed.net for more information about LCHF.